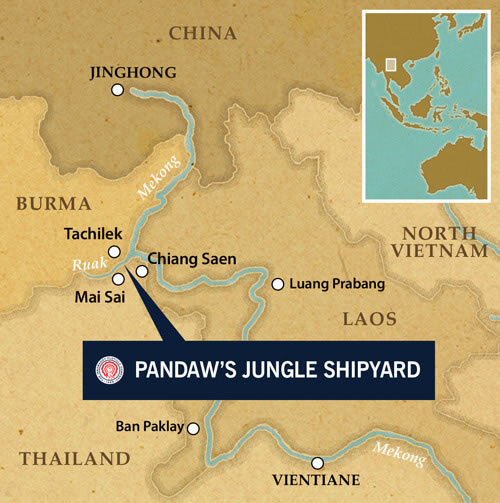 In the Golden Triangle, the remote spot deep in the Southeast Asian interior, near where Thailand, Laos and Burma meet, Captain Duncan Trollope is working long days, seven days a week, to complete our newest ship, the RV Champa Pandaw. The deadline is unforgiving. She must be in time for its maiden voyage on 21 Sept, starting in the Lao capital Vientiane sailing all the way to Yunnan in China on our unique four country cruise, The Mekong: From Laos to China (including Thailand and Burma). Every morning, Captain Trollope (68), Pandaw's New Build Supervisor, commutes by long-tailed boat from the riverside Thai town of Chiang Saen 15 minutes up the Mekong and its tributary the Ruak to the Burmese port town of Tachileik, close to the river crossing at Mae Sae. There, amidst the clang and thud of hammers, the buzz of saws, the roar of generators and the flicker of oxy acetylene torches and flying sparks, he presides calmly over what must be one of the world's most remote and unusual shipbuilding yards. These fascinating photos offer a rare insight behind the scenes of the Pandaw ship-building operation. The are provided by Captain Trollope, who is tasked with ensuring that any problems are solved and that progress is both smooth and rapid. Duncan supervises a 50-man team of Burmese shipbuilders, transferred from Mandalay to this remote jungle encampment where they work "from seven to midnight" to complete the 44.5m-long addition to our fleet. When this phase is completed, Champa Pandaw will then be sailed downriver to Thailand, where the components of the luxurious finishing touches that distinguish our ships can be more easily supplied. Champa's hull was built at an existing shipyard on the Laos side, Captain Trollope explains, but to install the two powerful, 720HP engines she needs to beat the strong upper Mekong currents, and to finish her to Pandaw standards requires special experience and expertise. Only trusted Burmese teams can deliver that. Our tried-and-tested teams of metal workers, carpenters, plumbers, electricians and engineers can be relied on to deliver the standards that our loyal passengers, have come to expect. A Singaporean national with a distinguished career as a mariner and shipping agent behind him, Captain Trollope is now one of the pillars of the Pandaw operation. A direct descendent of the great 19th Century English novelist Anthony Trollope (1815-1882) – he is a keen member of the Anthony Trollope Society. He joined us 15 years ago, as a consultant commissioned to carry out a maintenance audit of our fleet. In 2014 he was appointed to supervise our innovative build process, and has already played midwife to the births of four new arrivals. How does he find the life in this remote spot, spending long days in the remote part of the Burmese jungle with 50 working guys, whose language he doesn't speak? It doesn't sound like a job for the faint-hearted. "It's full of challenges" he admits with a characteristic chuckle. "I have to source parts in Thailand as well as oversee the work, but I have a right-hand man who liaises with the men and he speaks and writes English pretty well." Each of the individual teams is under-managed by a highly competent Burmese supervisor so, despite the isolation and intensity of the jungle shipyard, personnel problems are rare and the atmosphere is purposeful and busy. This corner of the Golden Triangle is a kind of entrepôt for the Thai Mekong trade. Boats buzz from shore to shore, laden with cattle and pigs. An idyllic spot, it is long regarded as the end of the line for the Thai hill-tribe trekking fraternity, who come here to chill out and savour the dramatic horizons. Selecting it as a shipbuilding location might seem like an act of bravado worthy of Werner Herzog’s crazed visionary Fitzcarraldo. Captain Trollope has no time to ponder such comparisons, or to savour the sweeping vistas of these remote highlands. Nor will his task end when Champa Pandaw (named after the national flower of Laos), is finally completed. He will be accompanying her downriver to the Lao capital Vientiane to sort out any prospective teething troubles, applying the obsessive attention to detail and ability to get things done that make him one of the heroes of the Pandaw operation. When you have the chance later in the year to come on board and admire her in finished glory, remember these pictures, and wonder at how far she has come in such a short period.